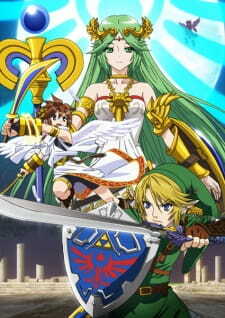 A promotional video for the new Super Smash Bros Wii U and Super Smash Bros 3DS featuring Pit, Link, Dark Pit, and Palutena. Since this has an entry why not give it a review? 2) Palutena's entrance is really annoying. Art and Sound were really good. I would highly recommend watching the raw version though (the dubbed version's voices were a bit messed up). I believe that the primary reason for watching this is Link...and you get to see him actually fight in an anime scene, what else is there to say? You 've got nothing to lose whatsoever, it's 2 minutes long, just watch it. Well as this has its own page I thought I would write a review on it. This wont be long as the video itself is only around a minute long and it is my first review so keep that in mind when reading. The video does not really have a story and is only really there for showing off the characters and promoting the video game, but in the short time it is on it really gets you excited. When I first watched the video I was amazed and thought Nintendo was making a Super Smash bros anime (sadly not) It looks amazing the characters act like you expect them to in a fight. I really love how they didn't make Link talk but still had him show emotion with his actions. This short video is awesome and it really makes me want to see a Super Smash Bros anime, I feel that it would be amazing after watching this short one minute video. While i can appreciate the transition from anime to the gaming world it has some flaws along with the pros. In terms of story i think a little more detail on the character's background is needed. Link i am sure most gamers know his origin from gaming, since he is a gaming character. As for the other characters show they all appear to be related to each other from some anime. Would be nice to know what the anime is? What the anime plot for the characters are? What drives each character? One of the many reason why i like anime is how the art is drawn. Most often it is in the style of a super powered high definition television. While gaming sadly still remains as sad printouts for lack of a better terms for some games. This can be seen when you look at the character art difference between when the character's lips are talking to when the character's voices are in overhead monologue form. Overall: While i appreciate the idea of providing context to the new character's addition to show one amazing art form that won't be included in the game is a bit of a drag. Which seems to happen a lot in games. Where the trailers are wonderful but when playing the game it is like you got a bootlegged version. Where a lot of flaws exist.